This totally wireless and easy to install PIR motion sensor with 120dB Alarm with strobe light and door chime is ideal for protection your home, office and store. IT can be placed on a table or hung on the wall with the included adjustable mounting bracket. It will detect motion from up to 30 feet away by120 degree wide. If not disarmed by the owner-by using the remote control- it will respond with an ear piercing 120 dB alarm and the flashing light which will scare off the intruder and alert others to your need of help. This alarm / door chime is packaged with features. You may select either alarm or door chime mode by simply holding the remote button for 3 seconds. Entry and exit delays with LED indicators for alarm mode only. The alarm will sound for approximately 35 seconds and then reset unless more motion is detected. 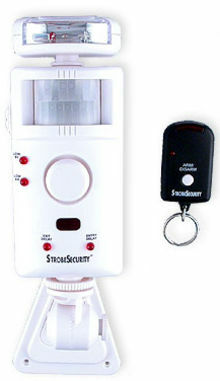 The alarm also allows you to set your own programmable codes for additional security. You never have to worry about the batteries being dead-even though the unit comes with a low battery indicator- since the unit can be powered by an 9v AC adapter that is not included. A switch on the side of the strobe light allows the light to remain on and be used for emergency lighting during a power outage. Ideal security for a home, retail store, office, dorm room, or hotel room. This unit comes with one IR remote control. The alarm / door chime requires one 9 volt battery and 4 AA batteries that are not included. It can be powered by an optional DC 9 volt power adapter (not included). For example, Radio Shack power adapter model # 273-1768 with tip # 273-1705 will power the unit. Be sure to set the correct tip polarity (incorrect tip polarity can damage the device or adaptor). Read the directions carefully or bring the device into Radio Shack. Dimensions are 6 .5 inches x 2.5 inches x 2 inches.